(by Marisa Schultz and Bruce Golding, NY Post) – Ukraine braced for war Monday as its president warned of a potential Russian invasion in the wake of Sunday’s attack on three Ukrainian military ships. “It is introduced with the sole purpose of boosting Ukraine’s defense in the light of a growing aggression from Russia,” he said in the capital city of Kiev. Ukraine’s navy has said Russia captured 24 crew members, including six who were wounded when their ships came under fire off Crimea. 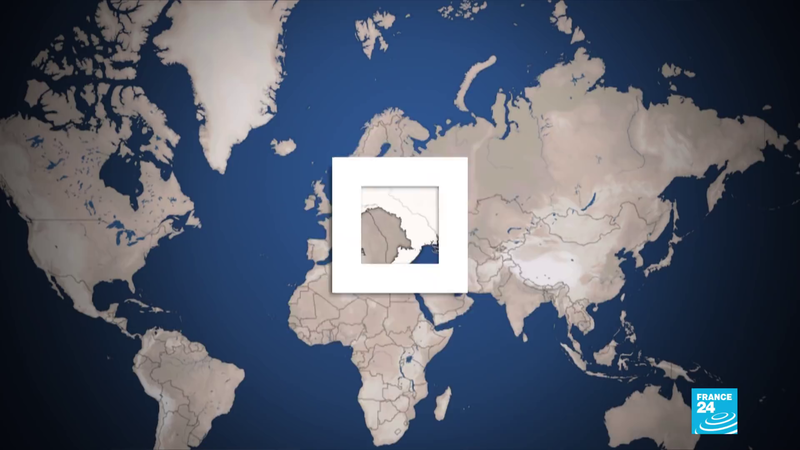 Russia invaded Crimea and annexed it from Ukraine, a former Soviet republic, in 2014 and about 10,000 people have been killed in ongoing fighting between Ukrainian forces and Russian-backed separatists in eastern Ukraine since then. …President Trump is scheduled to meet with Russian President Vladimir Putin this week at the G-20 summit in Buenos Aires, Argentina. A 2003 treaty [signed by Putin] designates both the Kerch Strait and the Sea of Azov as territorial waters shared by Russia and Ukraine. But Russia has sought to assert greater control over the narrow passage since seizing Crimea, and this year opened a 12-mile bridge that links the former Ukrainian peninsula with Russia. 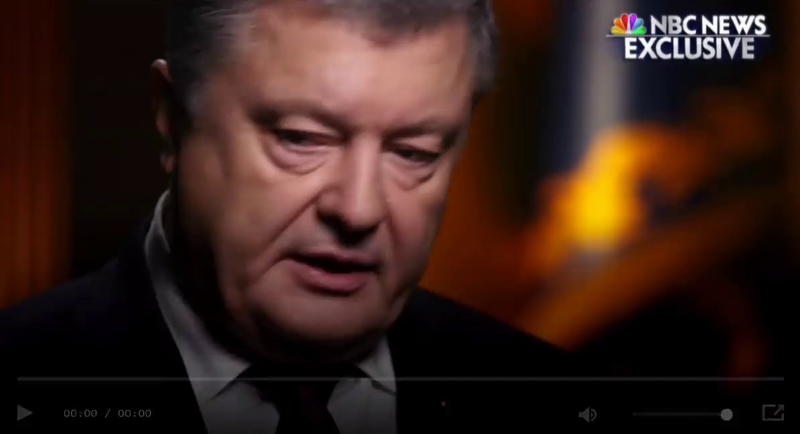 …..
Poroshenko said 10 of Ukraine’s 27 regions — the ones most likely to bear the brunt of a potential Russian strike — would be subject to martial law. 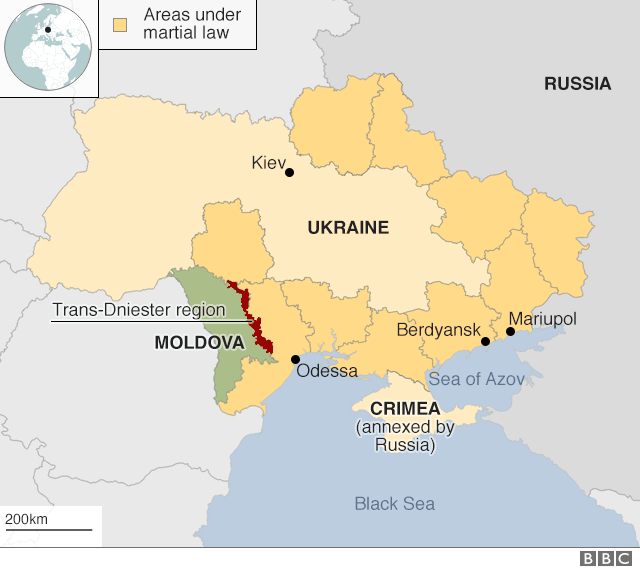 Areas of martial law in Ukraine. The move, which was overwhelmingly approved by lawmakers following five hours of debate, marked the first time martial law has been declared in Ukraine. From NYPost .com with Post wires. Reprinted here for educational purposes only. May not be reproduced on other websites without permission from the New York Post. 1. Name the presidents of Russia and Ukraine. 3. a) For what reason did the president of Ukraine ask parliament to impose martial law? b) What is martial law? c) For how long and where will martial law be imposed? 4. 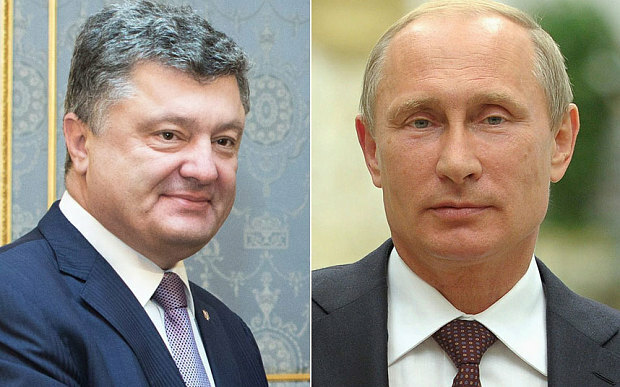 How are world leaders reacting to Russia’s attack on and seizure of Ukrainian military vessels? 5. a) What accusation did Russian Foreign Minister Sergey Lavrov make against Ukraine? b) Why is Lavrov’s accusation not valid? Russia cannot be allowed to get away with this continued bullying of Ukraine. By steadily tightening its hold on Crimea, it is gambling that the West will not have the stomach or stamina to impose ever more punishment or provide more military support for Ukraine. But a direct attack on Ukrainian ships cannot go unpunished. Strong condemnations will not do. The United States and its Western allies can impose stronger economic sanctions, bar their ships from entering Russian ports in the Black or Azov Seas or increase military support for Ukraine. These actions all carry risk, but so does doing nothing. Ask a parent or grandparent: Do you agree with this assertion? Please explain your answer. Russia’s attack on Ukrainian naval vessels in the Black Sea was a violation of international law and a dangerous escalation of the undeclared war the Kremlin has waged for more than four years against Ukraine in Crimea, in the breakaway provinces of eastern Ukraine, and now at sea. The Kremlin can shout all it wants about a provocation, about an attempt by the Ukrainian president to create a political diversion or about anything else, but none of that changes the fact that Russia had no legal justification for firing on three Ukrainian boats and seizing them. 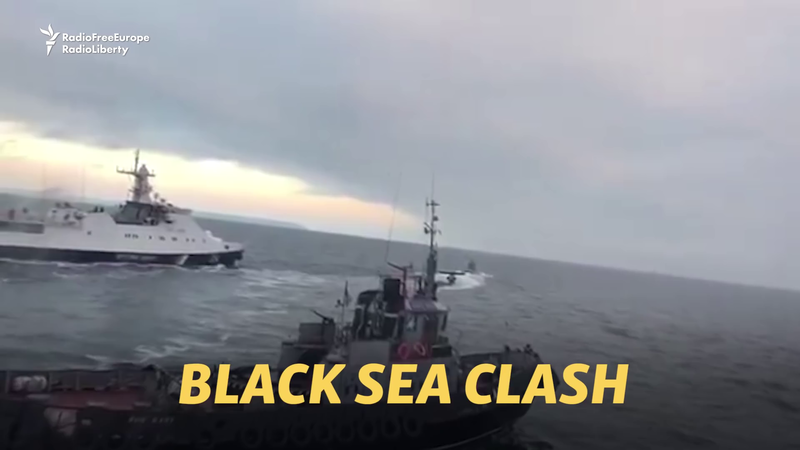 The vessels, two small armored boats and a tugboat, were headed for the Kerch Strait, which separates Crimea from Russia and is the only entrance to the Sea of Azov, where much of Ukraine’s coastline lies. Russia claimed they had crossed into Russian waters, but that is based on its illegal claim to Crimea, which it seized in 2014. Ukraine and most every other state in the world still regard Crimea and its coastal waters as Ukrainian territory. And under a treaty ratified by Ukraine and Russia in 2004 — a now hard-to-imagine time when they could still refer to each other as “historically brotherly nations” — the Azov Sea and the Kerch Strait were defined as shared territorial waters. That treaty, signed by President Vladimir Putin of Russia, is still in force. 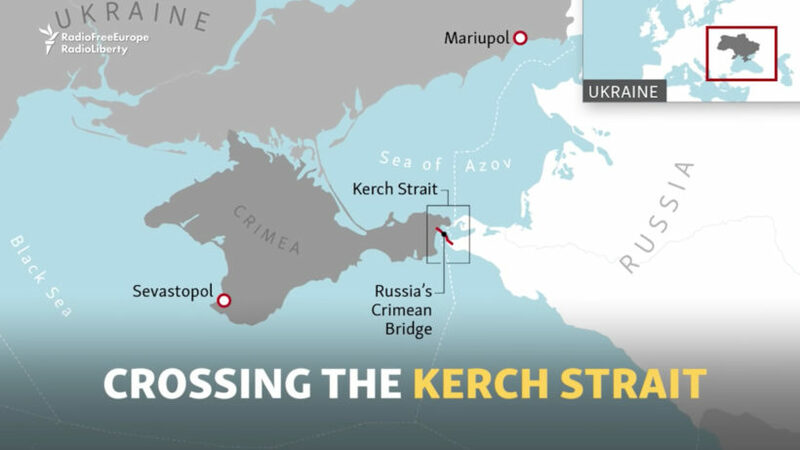 Yet ever since Mr. Putin opened a new bridge over the Kerch Strait in May, Russia has moved steadily to impose its control over the strait and the Azov Sea. The Kremlin has moved several gunboats into the shallow sea and has begun stopping and inspecting cargo vessels headed for the Ukrainian ports of Mariupol and Berdyansk, creating long delays and causing large losses to shipping companies and the ports.